I’m proud to say that Brute and Friends of The Web joined forces on the new Brute.is. 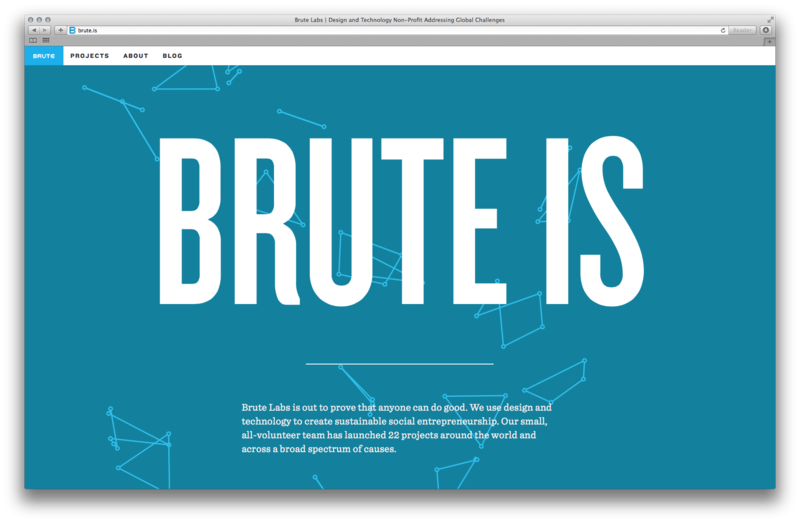 Together, we tried to distill Brute’s vision and uniqueness into a bold, friendly, and sustainable website to serve as a hub for Brute’s diverse projects and partners. Brute is not a typical organization. It does not sell a product or offer a service. It is primarily a connective tissue, bringing together worthy social initiatives with independent designers and studios who strive to do work that has tangible impact, even on a small scale. With every decision we made on the website we wanted to celebrate all of the partnerships Brute has facilitated over the years and the projects that have resulted from those collaborations. With the home page, we saw an opportunity to display Brute’s projects and partners in a unique way that didn’t have an implicit hierarchy or favor one project over another. Seemingly obvious ways to order the projects, like alphabetically or reverse-chronologically, will inevitably leave certain projects unjustifiably neglected. Our hope is that the dynamic home page will encourage visitors to explore the projects equally, discovering first-hand the diverse impact Brute has both across the globe and in their own backyard. One of the most important considerations we have for any of our projects at Friends of The Web is sustainability. The web is constantly growing and changing, as is Brute and all of our clients. No matter how beautiful the site is on launch day, if it’s not designed and built to navigate these inevitable changes it is ultimately a failure. This mentality guided our decisions behind the scenes about how to build Brute.is. We didn’t want the site to have unnecessary dependencies on a framework or CMS that would be bloated with unneeded features and frustrating to manage the content within, so we designed and built a custom CMS just for Brute. This administration panel efficiently meets Brute’s humble needs and is lightweight and flexible enough to be easily extended in the future. Most importantly, we haven’t locked Brute into a pre-existing structure for their content, as many out of the box content management systems do. This means that we can carefully examine the needs of the site and Brute’s specific content before deciding to add features. 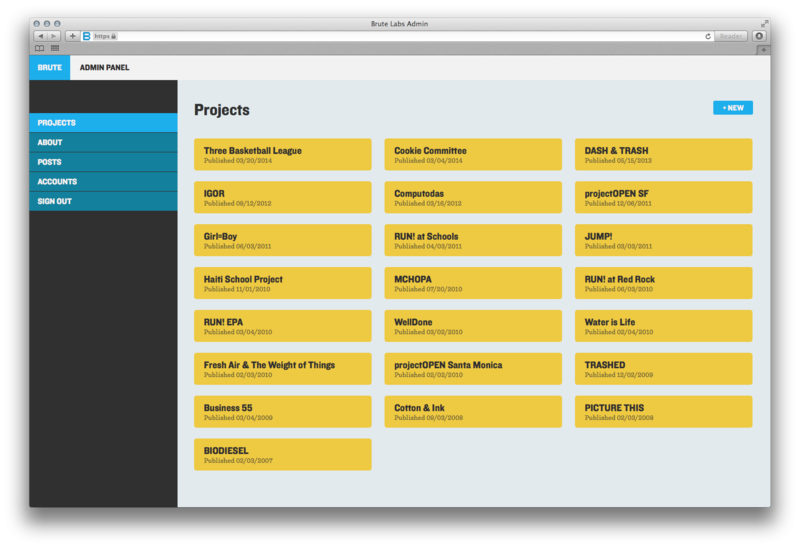 When the number of projects becomes too numerous and the homepage and navigation we’ve designed become unusable, we’ll be able to decide on whatever filtering, searching, or other organizational system fits Brute just right. We could even invent a completely new one. If we were using Wordpress or something similar, it would be difficult to approach the problem in this way. Brute would probably end up using categories or tags, simply because Wordpress already has them built in, whether they were the right fit or not. Our hope is that what we have built for Brute is like a seedling that will be nurtured and grown by us and others well into the future instead of just completely overhauled in a few years. We’ll know then if we’ve been successful.